Budget airline was practically unheard of in Malaysia until AirAsia took the aviation industry by storm in 2002. 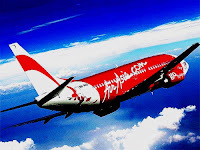 With an on-the-dot tagline "Now Everyone Can Fly", AirAsia made many non-travellers into avid travellers by offering tickets at more than 50% discount compared to conventional airlines. The no frills concept, which means that no meals will be provided or seats without numbers, was never an issue for travellers on a budget. In merely 5 years, AirAsia has become the most successful Malaysian business venture, even winning the coveted "Best Low Cost Airline - Asia" award last year. So, check out the many offers that of AirAsia throughout the year. The faster you book your flight, the cheaper the price of the ticket. Weekend and public holiday fares are generally higher than weekday fares. You can book your tickets online or at the various ticketing counters nationwide, among which is at the KL Sentral Station, the transportation hub of Kuala Lumpur.